The healthcare industry does not have the luxury of skimping on their HVAC system. The health and lives of patients are in the hands of a facility that is expected to maintain its environment at the best standards possible. Failure to do so can result in expensive litigation, a damaged reputation, and even death. Contaminated air is the healthcare industry’s worst enemy. Humidity is the perfect environment for dangerous molds to thrive. Bacteria and allergens spread when air isn’t flowing appropriately. If an HVAC system is not able to properly regulate the air, this is a massive problem. Poor air quality can make a patient’s health plummet. 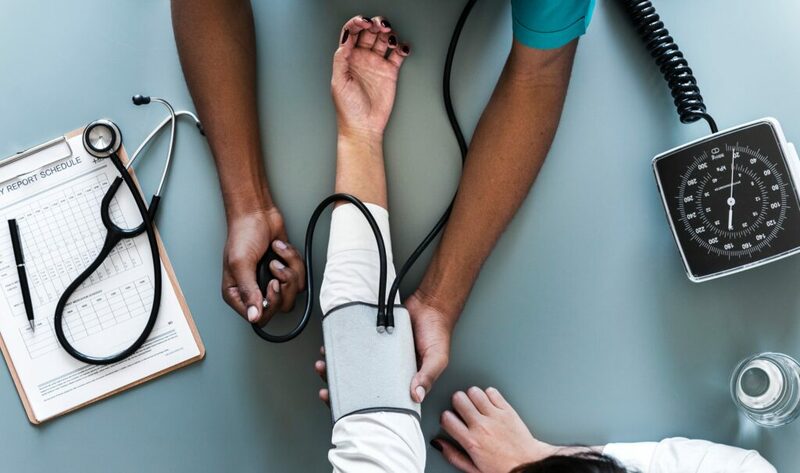 A neglected system will not be able to provide the proper air quality a healthcare facility needs, so it is important to make sure all HVAC components are functioning at optimal efficiency. There are federal standards for temperature controls in a healthcare environment. Failure to adhere and report any sort of temperature variance can result in hefty fines. Exposing patients to extreme hot or cold temperatures can dramatically affect their health and is not something to be taken lightly. Maintaining a comfortable temperature for all patients is a must in a healthcare facility as each patients’ needs are important and should not be ignored. It’s important to make sure an HVAC unit is up to standards to run efficiently at all times. The CDC’s Guidelines for Environmental Infection Control in Health-Care Facilities has a whole section dedicated to HVAC recommendations. Filters must be continuously monitored to ensure dust will not cause issues, and even as far as removing bird nests from outside components is mentioned. These little things can greatly determine an HVAC unit’s effectiveness and ability to provide the proper air to a facility. Any sort of neglect can lead to an unexpected breakdown that a facility does not have the luxury to undergo. One of the most effective measures a healthcare facility can take is getting into contact with a HVAC contractor and getting on a preventative maintenance plan. The right HVAC contractor will take the time to properly ensure that all systems will get the utmost care that they need so patients can remain in good standings. 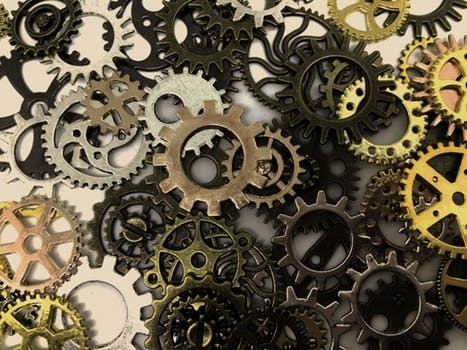 Being on a preventative maintenance contract will ensure that patients will always be in the best care that they can be, as facility employees can focus on other priorities knowing that their air handling system is under control. 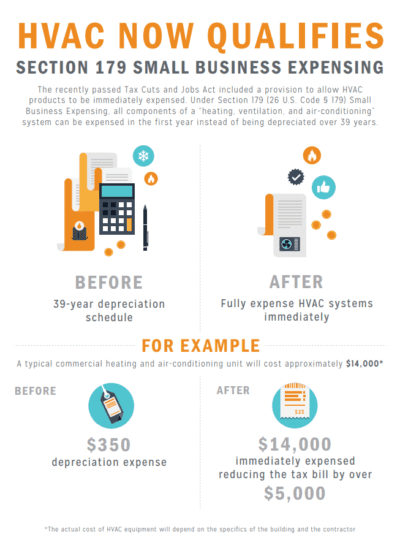 Under the Tax Cuts and Job Act, businesses are now allowed to fully expense all components of an HVAC system in the same year that they are acquired rather than depreciate them over 39 years. This means huge savings. As you may already know, R22 is being completely phased out by 2020. This means you will eventually have to replace your HVAC unit if it still requires the use of R22 refrigerant. If you do not make the switch, repairs will become costly and you are putting of the inevitable of having to replace your system. With the new tax break, making the jump to replace your HVAC systems will be easier as you can reduce your tax bill within the same year of purchase. If your unit is failing and costing you with the frequent repairs, you may want to go ahead and start fresh with a new system. If a new system is in your future but you aren’t sure if you want to make the decision to change, take into consideration how tax laws can change frequently. You would not want to miss out on this opportunity. If you are ready to make the investment and save big this year on your taxes, be sure to get in touch with a trusted commercial HVAC contractor.